The city’s trash crisis is getting worse and city hall appears helpless to solve it. Pattaya’s current garbage collector won’t invest in more trucks or staff, its dumps are at capacity and the budget already is busted. The city’s trash crisis is getting worse and city hall appears helpless to solve it. City council Chairman Anan Ankanawisan met with Pattaya’s mayor, his top deputies, local environmental agencies and other city department heads April 27 to brainstorm ideas on what to do with the tidal wave of waste Pattaya is drowning in. 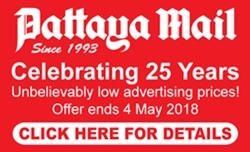 Environmental workers said the original estimate that Pattaya is generating 450 tons of garbage is wrong by as much as 30 percent now. The Khao Maikaew dumpsite is nearly off limits and the Sukhumvit Soi 3 transfer station cannot accept any more garbage. Meanwhile, trash cans around the city are overflowing and left uncollected for days as the current trash collector has proven unable to keep up. Yet, at the same time, the contractor refuses to spend more on trucks or staff. 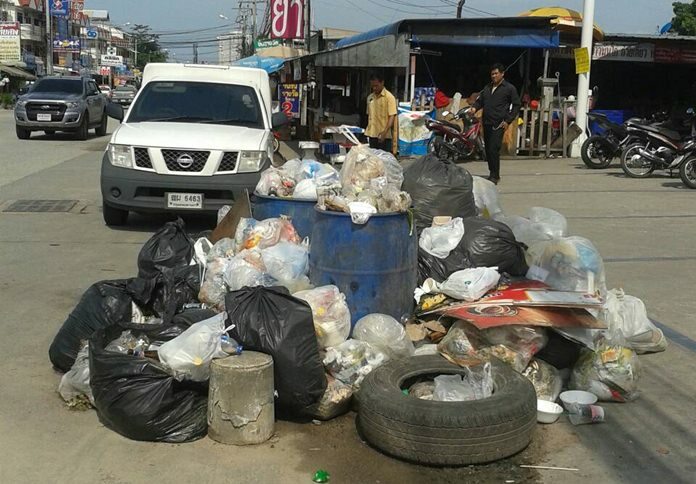 Anan said Pattaya’s contract with the trash collector is finished, but admitted city hall dropped the ball and has not yet organized a new bid. Basically, city officials acknowledge, things are bad and getting worse. With no solutions on the table, Anan simply ordered the sanitation department to accurately calculate how much trash is piling up per day so a new online bid can be started for a new contractor and calculate a new budget to solve the problem, even though no one can say what the money will be spent on.